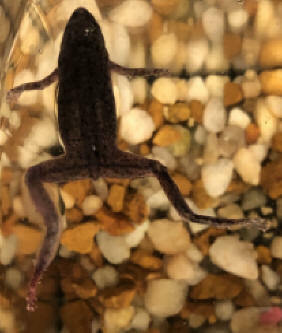 My name is Erica and my I have had three African dwarf frogs now for three weeks and all are doing great except last Sunday, one of my little guys got his leg stuck in our filter intake. We removed him and it definitely appeared he broke his leg. I isolated him for almost two days until he jumped out and went back into general population. Now today there is some huge white gross thing growing out of his leg and I have no clue what to do! Please help!! While these frogs are adaptable and easy to keep, they do have a few non-negotiable needs. Can these antibiotics be used on the frog that shares a tank with two other frogs And fish? <Yes and yes! Do be careful about mixing fish and frogs -- often ends up bad for the frogs. my daughter has 9 ADF. One died a few weeks ago (bloated?). as I got him from my grandma who had him since being a tadpole. He has developed what looks like a red bruise on his back leg. I have looked up possible answers and came across red leg syndrome. It doesn't seem to look the same as some photos posted and he is still very active and eating regularly. He is cleaned every two weeks and likes in a 5 gallon filtered tank. The tank has some large rocks that he may have injured himself on? It has only been a few days since I've noticed it. Please look at my attached photo maybe to help diagnose the issue. I have some sad news. First an update since we last corresponded. I purchased a ten gallon tank, with filter, heater, live plants, and some neat aquatic contraptions that are conducive for the needs of dwarf frogs (hiding spots, perches, etc). way over to the glass nearest me (I hand feed them, so they associate me with food). 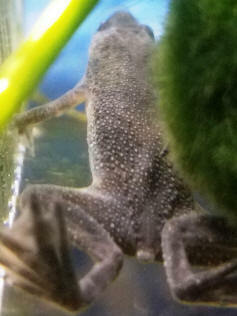 I noticed my male dwarf frog's right eye had the teeniest speck of red in it. I had to really look as it wasn't obviously noticeable and I wondered if it was just the light coming from the tank lid. Indeed there was a tiny bit of red in ADF's one eye. I made a mental note to myself to keep an eye on him and ask some questions about it today. He otherwise was fine, swimming all around, eating, etc. Just the day before he was happily mating my adult female as per usual. Upon waking up today, to my horror, my male dwarf was pressed up against the filter, with what looked like his little hands inside the filter slots. Right away I took him out and saw he was dead. How very sad. I don't know what he died from and I don't know how it happened so quickly. I know the filter's current draws waste into it and is why the little frog once likely dead was carried into it... but how did he die and how did he die so suddenly? I discovered one of my ADFs has a little bump, indent and grove a couple of days ago and it looked like an injury. to hopefully see if it gets better to no avail. I'm really concerned and am wondering what's going on. Please let me know, I've attached a few pics to depict it. I heard MelaFix is good for wounds. Should I try? and will it be detrimental? 1) I have a female ADF, and have had her for about a month now. Lives in a 15Gal tank with 4 other ADFs (2 female, 2 male). Nitrites, Nitrates, and Ammonia are all at 0, tested with an API Master Kit. Regular water changes done. 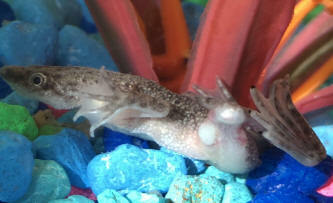 Diet consisting of frog pellets and frozen brine shrimp, one or two days of fasting a week. 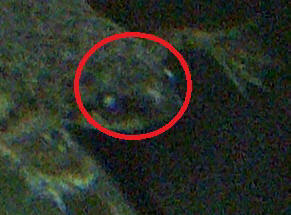 The two males do not mate with this particular ADF (that I've seen) but do with the other two females on a regular basis. One did help pull her skin off and ate it as she was shedding, it was quite bizarre and interesting to watch. 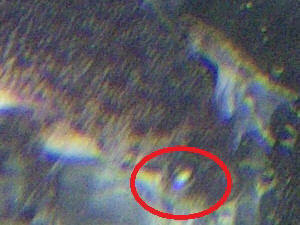 This frog has eyes that are not cloudy, it's more like white dots that "pop out", but the whole eye isn't bulged. Both of her eyes have been like this since I got her. Is she blind? She eats and swims and plays normally, and I saw her shed yesterday, it's just her eyes that are strange. It almost looks like oversized Ich like you'd see on fish, but I'm pretty sure that ADFs can't get Ich, and the medication is actually poisonous to them (correct me if I'm wrong). So both of her eyes have these white dots, and you can't really see the rest of her eye beneath the white dot (one on each eye, about the size and shape of a large grain of salt). I have attached 2 pictures (they’re not very good, she doesn’t like to sit still, haha) for reference. I've been “Melafix”ing for 5 days with no improvement (stopped last night), though awhile back it cleared up cloudy eyes in another one of my female ADFs, so it's certainly not useless - but she's been like this since the start... I'm apprehensive to use Maracyn II, even though it has been recommended, because we don't know exactly what (if anything) is wrong. If she remains acting healthy and still has the white dots, and as long as it doesn't spread to any of the other ADFs (which it hasn't so far), then maybe she really IS blind? Or just some weird deformity that's otherwise harmless? I know some deformities can cause fish to be unable to reproduce (we have a male guppy in a different tank who’s like that), and as I mentioned, this ADF hasn't been copulating with the males, so…deformity kind of fits? What could this be, and if it's an illness, how should I help her? 2) The eldest of my female ADFs (living in the same tank and conditions as described above) has been behaving what I believe to be “abnormally”, lately. I should add that we have had her since September 2011 and she is 3” fully stretched out (yes, we actually measured when she was …well we call it “Matrixing” on top of the thermometer, stretched out as tall as she could be). She participates in amplexus regularly with the two males in the tank, but have never seen them reach the point where they go up to the surface together and flip over to lay/fertilize the eggs. I have, however, seen eggs sticking to the floating plants shortly after I had put them in there. I haven’t seen any recently, but I also haven’t looked that hard. I believe they came from Mama (that’s what we call her, as she’s the oldest female and soooo big [but not fat! ]), but I honestly can’t be sure. As I briefly described, I recently added soft, fake floating plants to my tank (they already have a little house thing that’s spacious and has three large entrances/exits, and a large fake log with fake, soft leaves attached – bare bottom tank, by the way), and she’s starting hanging out up there, usually flat on her belly if she can. She holds her head above water and does what I can only describe as “shudder”, lasting a second or two, and occurring approximately every 15-30 seconds. I tried to film it but you can’t make it out in the video, so I won’t attach. I opened the lid the other day while she was up there and gently blew on her face (out of the water of course), and it caused her to shudder more often (pretty well each time I puffed some air at her). I only did this a couple of times, as I didn’t want to stress her out. Is this normal mating behavior or could something be wrong? She does this several times a day, that I’ve been able to see. The other ADFs have all “chilled out” in the new floating plants, but I’ve only seen Mama behave this way. She eats fine and swims fine and otherwise appears perfectly healthy. I just don’t want anything to happen to her, I’m quite attached to all of my froggies, but she’s been with me the longest. Any help would be greatly appreciated, as I haven't been able to find exactly what I'm seeing online. My success with these wonderful froggies so far has been 5 out of 8, and I’m pretty sure two of the three that passed away were ill from the store. In these two cases I’m trying to be proactive, instead of treating (and eventually losing the battle) when it’s noticeably too late. Thanks in advance, your site has been SO helpful with all of our fish and frog questions and care information! It is with a heavy heart that I write today, and am hoping for a quick answer and much-needed advice. I've searched through your FAQ's and other letters, but am having trouble finding things that apply to my situation (this may or may not be due to my current frazzled state of mind). he has been in this 29g for nearly 4 weeks now. Water is cycled and stable, creatures are all doing very well. (Frog was to have been moved to a 5 gallon dedicated tank within the next week, as the cycle in THAT tank becomes established) They were fed this morning as usual, and then I got buy with the morning (family) rush and didn't have a chance to check in on my tank for several hours. During this time the bottom section of the filter intake (45g whisper filter, intake covered with fine mesh to prevent frog's legs from getting stuck) FELL OFF (with the mesh) and onto the aquarium floor. When I got a moment to enjoy my creatures, I began a search for the frog, which ended when I found him INSIDE of the filter box. He must have been sucked in through the filter tube and into the box at the top of the tank. He was found on the wall, above the water, still very wet and obviously unhappy, about 2 hours ago. He was put immediately out of the filter basket and into the water, and observed for a time. Obviously showing signs of stress, color very pale. He seems to have developed white bumps on his body (probably also a stress reaction), has no interest in food, etc. I am unsure if any of his limbs are broken, but after much observation, I think that they are okay, however the skin on his back flipper between two of his 'toes' is torn. He is having trouble swimming, he can still get up for air, but swims in a floppy, floaty sort of way, and seems to have trouble swimming in a straight line. I'm not sure if this is solely due to his obvious foot injury, or if there is some darker internal damage behind it. He is also being very affected by the current in the water. While not very strong, he is having trouble keeping his place while swimming, and gets sucked back toward the filter. If he gets too close to the filter, he is unable to free himself without assistance. I have since added to his stress by moving him into my much shallower (fully cycled, same water parameters, same temperature) 10 gallon 'hospital' tank, which is inhabited by 4 female guppies. I moved him hoping that the smaller filter, shallower water, and quieter/calmer/darker place in the house would help him feel more comfortable, though I wasn't sure that moving him was a good idea at all. The filter in the smaller tank has been blocked with some mesh, and I planted hornwort densely around the intake to prevent him from having so much difficulty with this filter (though it is smaller). I also have tuned the lights off in the aquarium to help him feel more at ease, and have been keeping a steady eye on him. Is there anything I can do to help him feel better / ease his stress? Is there something that I should apply to his foot wound to prevent infection, or the tank as a whole to help him heal? Are there any signs/symptoms that I can watch for and attribute to stress, and are there signs and symptoms that I should be looking for regarding to something else - sickness, injury, internal damage, etc Seeking ANY additional advice you can think of that might aid me in helping my frog pull through this horrible accident. . . I'm still new to ADF care, and it can be difficult to find solid information on these guys. Any advise you can offer will be very much appreciated and acted upon. 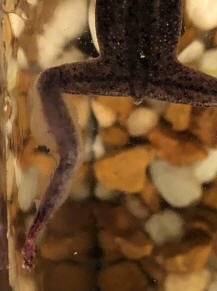 I have an African Dwarf Frog I have had him for about 6 months and within the last week he was injured and has quickly gotten worse. Originally the foot of the frog was a little red. Next it seemed to spread up his leg. Is it likely that the anti fungus medicine will help? Is that the best course of action? If not what is? I would greatly appreciate if you could help me out I really feel so bad for how this frog is hurting and that I don't know how to help him. Thank you so much for your time and help? First some background... My daughter was recently and unexpectedly "gifted" with 4 ADF's from her 4th grade classroom "zoo." The critters were apparently kept with bare accommodations, and were delivered home in near freezing weather in a 6 oz plastic drink cup with a couple of sprigs of duckweed and a bit of gravel. All were in various states of illness or injury -- an abscess here, broken toes, what appears to be broken jaw, with ripped skin, and a rampant fungal/bacterial infection (some kind of pinkish fuzz at various locations). I'm sure all of the issues were from ignorance and a bit of unintentional rough handling. Needless to say, we were not prepared, and "Thank You!!!" for your website. I've kept tropical fish before, but never amphibs, and would have been lost without the info you have on the site. I've done some scrambling and managed to first transfer the remaining first to a 1 gal bare container (a big mason jar) with plain, room temp spring water, and have rushed a 10 gal tank with proper filtration, water prep, and heat into service (probably too fast, but think I can deal with NH3 and NO3 as needed). I've been treating for bacterial infections with tetracycline and the fungi with "Fungus Cure", doing 50% water changes with meds refreshes every 24hrs, and have raised the water temp at a stable 82F. And it seems to be working... Four days on, and the three surviving froggies are more active, eating well (with one exception, below), the fungal fuzz is all but gone, and the visible abscesses are noticeably smaller or gone. One of the frogs did lose a couple of toes, but I'm pretty sure they'll grow back in time. So far, we've only lost one of the beasties, and he died within hours, before I could even get water in a 1 gal jar up to room temp. Probably injury plus stress. Poor fellow. Now the problem... One of the frogs has a severe mouth injury. It appears that the lower jaw is broken, and a significant portion of the skin from the lower jaw is simply gone. When I first got the animal, the injury was masked by fuzz from what I now think was a bacterial infection around the wound. The tetracycline seems to have dealt with the infection, but I'm at a loss on what I should do with the injury. I know frogs and other amphibs have really robust healing mechanisms, but I'm concerned that the frog may not be able to ingest enough food to prevent starvation before the wound heals. So, is there anything I can do to either speed up the healing, or any way of preparing food that will make it easier for the frog to eat? I've been feeding wet frozen brine shrimp, and the frog is active and interested in the food, but seems to give up after a few minutes. I've tried mashing the shrimp into paste, and have been using a drop tube/pipette to put the food on a smooth feeding cup I have in the tank. So far though, the frog is slowly losing body mass. Or, should I euthanize the animal and spare it a slow death from starvation?